Much more to come from event photographer Edwin Anglero, but previous Media/Marketing Manager of DTE, Julia Rosenfeld, has some beautiful shots from this year’s festival. Check out the rest of Julia’s pics here. Unfortunately we have been forced to cancel tonight’s Youth Kick-Off Event for the Red Hook Waterfront Arts Festival, due to the rain. Artists and community partners (heck, anyone) can call us for details- (718) 643-6790 about when tonight’s programming will be relocated- we’ll try to move as much as we can to tomorrow’s activities. Months of planning and the dedication of wonderful professional artists, youth groups, and community partners come together this weekend for the 16th Annual Red Hook Waterfront Arts Festival. Why: To feature the talent of Red Hook’s young artists, and to celebrate culture, community, and the beauty of Brooklyn on the breathtaking waterfront of Valentino Park & Pier. Looks like a fun time, and the Greenway Initiative is a great organization/partner for the Red Hook Fest each year. If you’ve never taken a bike ride to Red Hook, get on it! If you have, I don’t have to convince you it’s worth the trip. The “family pace” sounds right up my alley. 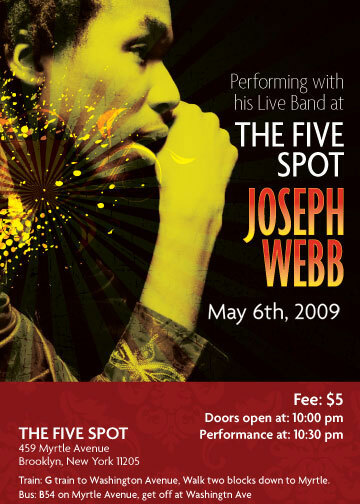 Joseph Webb, DTE teaching artist and one of the hot acts at this year’s Red Hook Fest, has a show coming up at the Five Spot. For a truly unique, wonderfully vibrant performance from a dynamic lyricist and dancer, make sure you’re there, 10pm. Joseph’s band brings a high-energy combo of jazz, soul, and funk for a show that’s a great time (and a bargain! ).